Lock in a great price for Quinta dos Padres Santos, Agroturismo & Spa – rated 9.4 by recent guests! Beautiful location. Lovely pool. Delicious food gorgeous surroundings . Breakfast was very nice and included in the price. Staff extremely helpful. The staff was amazing. Lina is wonderful and went out of her way to accommodate us. It was so relaxing there! And the dinner they offer is a good value for the money. Super friendly lovely staff, accommodating and fun! Lots of attention to detail in the quality of spa (sauna, Jacuzzi, steam) as well as in room (tiles, balcony, bed comfort). Plus dinner was delicious and very well-priced. I am absolutely going to come back for longer one day ... and pick cherries when they are in season :) LOVED meeting Lena and Sarah! Personal attention, awesome cherries and a very nice meal at the property. Great location, fantastic food and lovely people running the place. We loved having dinner there every evening. The staff is amazing and very helpful, the food delicious advice to try, bit expensive 25€ pp, but worth for and the spa are is just Wow. The staff were extremely helpful throughout our stay. We had a 10 month old with us and they did so much to help us (dinner at our room, highchair for the baby). They were also extremely nice and welcoming to the baby, which obviously helped him settle. One of our best sellers in Lamego! 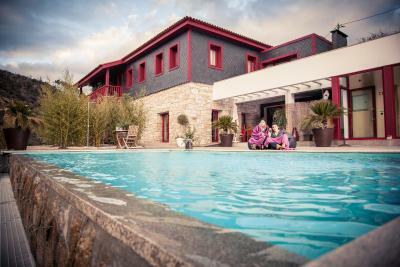 Quinta dos Padres Santos provides elegant rooms and accommodations in refurbished old watermills in Eira Queimada, Tarouca, 6.8 mi from Lamego. It offers a spa and outdoor pool in the Varosa River valley. Accommodations range from double rooms located in the farm to self-catering villas and suites. All include an HD flat-screen TV and Wi-Fi access. The Quinta dos Padres Santos’ restaurant serves regional cuisine. A wholesome breakfast buffet is served daily, including products from the farm. Guests can participate in the farm’s activities, from harvesting to weeding, or enjoy a horseback ride through the property. Those looking for relaxation can use the hot tub overlooking the valley. Indulge yourself with the variety of therapies available at the Spa. There are events rooms available. The 12th-century São João de Tarouca and Santa Maria de Salzedas monasteries are 6.2 mi and 3.7 mi away, respectively. Viseu is 40 mi from Quinta dos Padres Santos, Agroturismo & Spa. When would you like to stay at Quinta dos Padres Santos, Agroturismo & Spa? 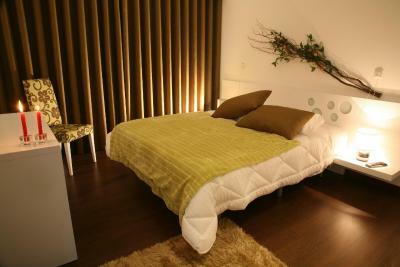 This elegant room offers parquet floors and a décor based on fruits’ shades produced in the farm. It comes with an HD flat-screen TV and a small desk. The private bathroom is separated from the room by a modern glass wall. It includes free toiletries and a bathrobe. Pets are not allowed. Offering a warm fireplace, this suite is located in one of the watermills and original features, as stone walls, have been kept. It offers panoramic views and a private patio. A small creek passes around the suite. The fully equipped kitchenette provides all the necessary utensils to prepare meals. The dining area includes a four-seater table and an armchair. There is a sofa-bed available to accommodate 2 guests. A modern walk-in shower, bathrobe and free toiletries are included in the private bathroom. Pets are allowed, upon request. Offering a warm fireplace in the living room, this villa offers panoramic valley views from the private patio. The fully equipped kitchenette provides all the necessary utensils to prepare meals. The dining area includes a table and chairs. This suite is located in one of the watermills and original features, as stone walls, have been kept. It offers panoramic views and a private patio. A small creek passes around the suite. The fully equipped kitchenette provides all the necessary utensils to prepare meals. The dining area includes a four-seater table and an armchair. House Rules Quinta dos Padres Santos, Agroturismo & Spa takes special requests – add in the next step! 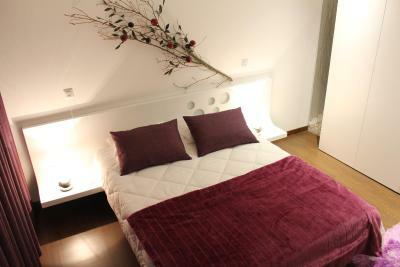 One additional child from 4 to 14 years is charged EUR 20 per person per night in an extra bed. 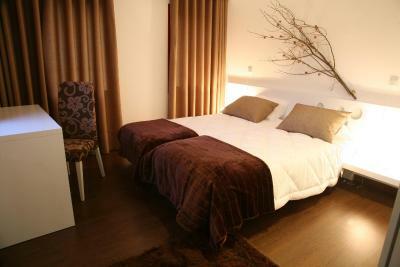 One additional older child or adult is charged EUR 25 per person per night in an extra bed. Quinta dos Padres Santos, Agroturismo &amp; Spa accepts these cards and reserves the right to temporarily hold an amount prior to arrival. Quinta dos Padres Santos, Agroturismo & Spa accepts these cards and reserves the right to temporarily hold an amount prior to arrival. Please note that meals can be served and should be requested one day in advance. Please note that access to the Spa is included in the room rate. This features access to the hot tub, Turkish bath, sauna, tropical shower, ice fall, and gym. Please inform Quinta dos Padres Santos, Agroturismo & Spa of your expected arrival time in advance. You can use the Special Requests box when booking, or contact the property directly using the contact details in your confirmation. Option to have had a smaller meal in the evening. The four wonderful entrees were more than sufficient at the end of the day. Comfort and remoteness of the property. Welcome. The spa facilities and gym could use some minor maintenance but were still nice. For example the exercise bikes were not operational during our stay. The staff is incredible and makes you feel really comfortable and at home. The surroundings are very peaceful and great for relaxing. The whole experience was very gratifying. Too bad the visit was short. A hairdryer would have been helpful. Wonderful stay. Loved home stay feel, great facilities(used all the spa choices)' very friendly and helpful staff, home style food was delicious (servings were huge). Visited nearby Ucanho, fabulous village and restaurant Mathias. Lina provides a pampered, relaxing experience for a fabulous stay for 3 nights. Everything was in best quality !!! Wonderfull place and people!!! You can feel like in heaven! The road to the hotel is difficult the first for foreigner first time as not wide too meet other cars in part of the road, but 2nd time on day not a problem. However recommed eating in the hotel as difficult to drive home at night and little within walking. Very nice location, extremely well kept hotell area. Quiet area with nice surroundings in orchards and excellent pool area. Practical rooms, not large but sufficient for family. Amazing value for food, actually way too large portions. You felt bad not terminating as it was great food but just too big portions with a full meal. Very friendly staff, both owner, supervisor and employees were friendly and very helpful. There were no channels broadcasting the World Cup - this was very disappointing for us. The rooms have no blinds (just curtains) so there’s quite some light early in a summer morning. Staff is super kind and friendly. They prepared us a snack upon request outside restaurant opening hours, which was so helpful as we did not have time to go grocery shopping (so couldn’t use the kitchenette in our room). They also gave us breakfast to bring with us on our last day there as we would leave before breakfast time (in Portugal the rule seems to be serving breakfast very late) The location is gorgeous. A fabulous view from the swimming pool, and many cherry trees around (you can help yourself to tasty, fresh fruit from the tree!) The jacuzzi is a nice feature in rainy days like the ones we spent there.